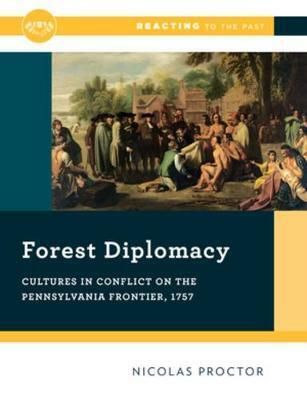 Forest Diplomacy draws students into the colonial frontier, where Pennsylvania settlers and the Delaware Indians (or Lenape) are engaged in a vicious and destructive war. Using sources-including previous treaties, firsthand accounts of the war, controversies over Quaker pacifism, and various Iroquois and Lenape cultural texts-students engage in a Treaty Council to bring peace back to the frontier. Nicolas W. Proctor is professor of history at Simpson College. He received his Ph.D. in U.S. history from Emory University and is the author of Bathed in Blood: Hunting and Mastery in the Old South. He is also the chair of the Reacting to the Past editorial board, and the author of Reacting games on the Seven Years' War on the Pennsylvania frontier, the Chicago Democratic Convention of 1968, Reconstruction in New Orleans, and the art of the Paris Exposition Universelle of 1889, as well as a handbook for Reacting game designers.